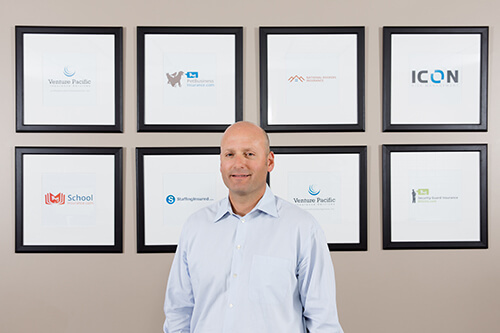 Craig began his commercial insurance career with Venture Pacific Insurance Services in 1999. He concentrated on and became specialized in the construction industry, metal and plastics manufacturer, and the security guard industry. Early in his career, as he become more involved in the security guard industry, it became clear to him that the industry was being under-represented by a broker that focused 100% of his time on providing security guard company insurance solutions and risk management strategies. Mr. Mount and Venture Pacific developed www.BSGIns to provide a web-based platform to gather information needed to quote a company’s insurance and to deliver industry specific information. BSGI has grown into a national program and can write insurance for security guard companies in every state. Mr. Mount, and BSGIns, takes great pride in providing competitive quotes, contract review, current insurance analysis, and exceptional customer service to his cliental. Mr. Mount earned his B.S. in physiology from Colorado State University in 1996 and is an active member ASIS and California Security and Guard Association (CALSAGA).